Autodesk Network License Manager (FlexNet Publisher 2018 R4 based) has been updated. License administrators must upgrade the license servers to the latest version, v11.16.2.0, when using Autodesk’s 2020 products like AutoCAD 2020 or Revit 2020. As it’s soon time for the new 2020 products you can prepare in good time. You find the latest installer here. adskflex.exe, lmgrd.exe, lmtools.exe and lmutil.exe are updated. 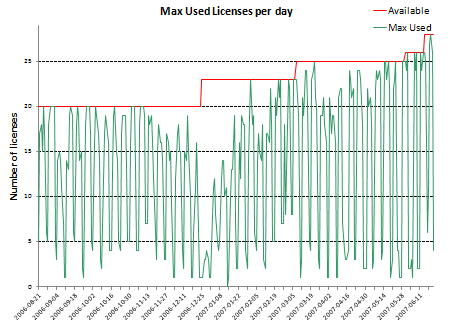 Our license usage monitoring software JTB FlexReport and the freeware JTB FlexReport LT work fine with this new version. More about Autodesk Network License Manager.